When most people think of November, they think of elections, Thanksgiving, and sweater weather. When I think of November, I think of book release dates. 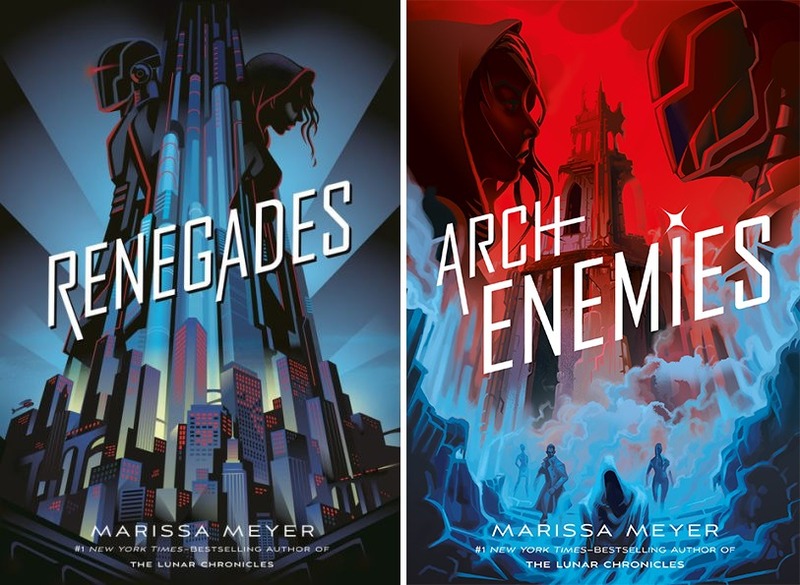 We are now mere weeks away from the release of Archenemies, the second installment in the Renegades series by Marissa Meyer. Best known for the Lunar Chronicles, her fairy-tale sci-fi series, Meyer has continuously won over fans for the past six years with her attention to detail and diverse characters. Previously sticking mostly to adaptations and retellings, Meyer did something new for 2017: a story about the intricacies and struggles of being a superhero. The result, Renegades, was released in November to widespread acclaim, and what had been set up as a two-book series has expanded into a planned trilogy. The first book tells the stories of Nova Artino and Adrian Everhart, two teen “prodigies”—people with superhuman abilities—on opposing sides of the law. Nova wants revenge on the Renegades for failing her when she needed them most; Adrian is determined to hunt down anyone who can answer his questions about his mother’s mysterious death. When Nova goes undercover as a Renegade, the two are forced to work together, all while their secrets boil just under the surface. Since Renegades is over 500 pages, there was quite a lot of worldbuilding—and a lot of questions raised that weren’t answered right away. As I’ve waited all year for November 6, I’ve found myself ruminating on what could possibly happen in this next installment, and I’ve narrowed down my inquiries to a list of five. Here are the questions I hope are answered in Archenemies. Warning: Spoilers for Renegades below. 1. Who Murdered Lady Indomitable? One of the six original Renegades, Lady Indomitable was a shining beacon of hope for the citizens of Gatlon City as well as being Adrian’s birth mother. She died under mysterious circumstances years back, and with her body was a note that read, “One cannot be brave who has no fear.” While engaged in a rooftop battle with Nightmare (Nova’s superhero persona), Adrian (as his own alter ego, the Sentinel) stops short when he hears Nightmare speak those words to him. Since Nova was raised from the age of six by her uncle, I have a feeling that Ace is behind Lady Indomitable’s demise. It definitely would make sense for him to want to take out the Renegades, and Lady Indomitable would be a good place to start. But some things just don’t add up. Lady Indomitable fell from a building, even though she could fly; Adrian concludes that she must have had her abilities drained before someone pushed her to her death. How did she lose her powers? That leads into my next question . . .
2. Was Max Involved in Lady Indomitable’s Murder? Max Everhart is Adrian’s adopted brother. He lives within the Renegades’ headquarters, in a special glass room to quarantine him from the rest of the prodigies. Max’s alter ego is the Bandit, named because he has the ability to steal other prodigies’ abilities merely by standing too close to them, making him much too dangerous to live out in the open. Before Max came to be Adrian’s brother, Ace may have used him to kill Lady Indomitable, or maybe someone else like Max was able to do it. It’s not clear whether anyone in this universe shares abilities; so far, Max is the only one to have the same powers as someone else, and that’s only because he absorbed them. I’m curious to know whether there’s another prodigy like Max who took part in Lady Indomitable’s death. It’s all speculation at this point, but I’m hoping Meyer details more of Max’s origins in Archenemies. 3. What Really Happened to Nova’s Family? Nova lost her family at the age of six. A member of an Anarchist gang shot her father, mother, and baby sister in their apartment, and she expected the Renegades to show up and save them. (This, of course, never happened.) Growing up with other Anarchists, Nova received a very slanted view of the Renegades and believes they don’t care about citizens in trouble nearly as much as they claim they do. After going undercover as a Renegade, Nova gains access to computer files in the Renegades’ headquarters and discovers that one of them contains more information about the night her family was killed. She doesn’t open the file that shows the important details, but we now know that it exists and that there’s more than she previously thought. So what actually happened? Part of me suspects that Ace sent this gang member after his niece’s family, but there’s no motive for that. And while I agree with Nova that the Renegades are not always on top of all crime in Gatlon City, I don’t believe for a second that they were to blame for what happened. The details of that file are crucial, not only to the plot but also to Nova’s beliefs. If she finds out that she’s been blaming the wrong people her entire life, I have the feeling her entire way of thinking will be turned upside down. 4. Who Is Phobia, Really? Phobia is the Anarchist we know the least about. He looks like the Grim Reaper and, like the boggarts in Harry Potter, can shapeshift into someone’s worst fear. This also allows him to physically become a shadow, effectively making him a specter of sorts. Aside from saying cryptic things and lurking in the background, he didn’t do much in the first book, but this certainly didn’t stop him from being a fan favorite. There’s so much Meyer could do with this character. Who was he before he became an Anarchist? Is he a person or is he really a ghost? Is he really an Anarchist or is he more of a neutral party? How did he gain his abilities? I think Meyer knows how badly we want to know about him, so she may tease hints throughout Archenemies, but she’ll most likely leave most of the explanations until the final installment. 5. Will Ruby and Oscar Ever Become an Official Couple? This is my most pressing question. Ruby Tucker and Oscar Silva are Adrian’s best friends and on his Renegade team; Oscar is able to emit smoke and fog, while Ruby’s wounds produce crystallized weapons made from her blood. The two are constantly flirting and bantering back and forth, and it’s almost maddening that they haven’t become a couple just yet. While Adrian and Nova’s relationship is clearly the main romantic plot, I personally loved Oscar and Ruby even more. They’re both such fun characters, and they play off of each other very naturally. I doubt Meyer would kill either of them off at any point, but there’s always the possibility that it could happen. The world of Renegades may be exciting, but it’s not safe for anyone—not even the main characters. I can only hope that Ruby and Oscar get some closure on their relationship before the end of the series. Will any of my questions be answered? If not in this book, then hopefully they will be in the finale. Archenemies is out November 6, 2018.